Startpage.com is the PUP that uses misleading techniques to prevent removal. Use Reimage to locate malicious components and get rid of them faster than with uninstall instructions. A full system scan blocks virus reappearance and prevents traffic to malicious domains. alteration of the infected Internet browsers’ settings. Startpage proclaims itself as a “Privacy-friendly” service and vows to protect its users’ privacy, guard them against targeted online advertising and provide a generally improved browsing experience. 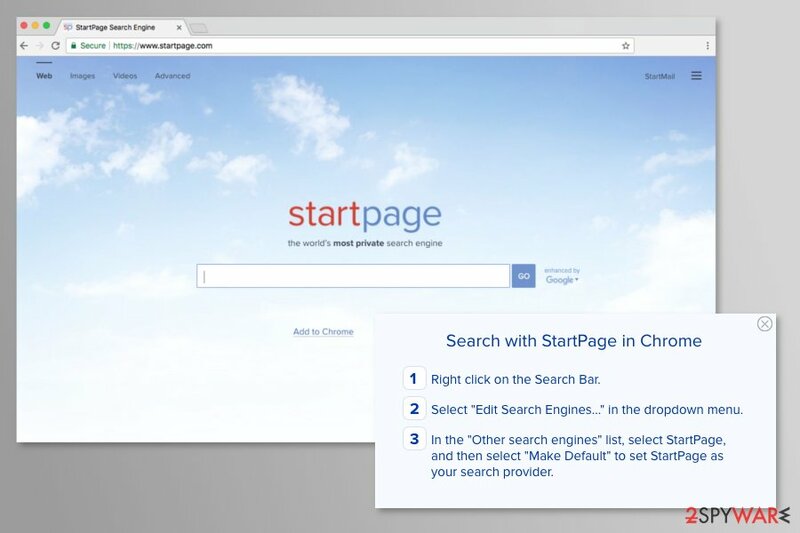 Startpage search engine offers to search in the web, images and videos categories. What is more, it has an advanced search feature that allows narrowing your queries. Developers also offer also provide additional email services and invite the users to sign up at StartMail.com. However, instead of enhancing the browsing experience, this site starts generating ads and tries to control your browsing habits. Start page search engine virus may show you altered search results and bombard you with tons of various pop-up advertisements that might be dangerous. In this case, the biggest problem is Startpage.com redirect tendencies. This cyber threat might display content that leads to harmful websites where you can get infected with malware or suffer from other cyber crimes. No matter how legitimate it looks, this tool can be used by cyber criminals. If you don’t wish to deal with these problems, head straight to the Startpage.com removal. Fixing your computer can be easier if you apply automatic virus elimination technology and use software like Reimage anti-malware. The hijacker can affect all web browsers that are installed on your computer, including Internet Explorer, Mozilla Firefox, and Google Chrome. Thus, you should remove Startpage from each of them. If you prefer to do it manually, you can find the instructions below. Startpage.com is a questionable search engine that promises privacy protection; however, it displays tons of aggressive and misleading ads. Startpage search engine virus spreads bundled with freeware, shareware, and other free applications. Thus, careless installation of software can result in the hijacked web browser. To avoid unintentional installation of PUPs, you should always select “Custom” or “Advanced” installation method instead of “Quick” or “Standard.” Then you will be able to opt out pre-selected third-party entries. After the hijack, you can follow a step-by-step Startpage removal tutorial which has been compiled by our experts and can be found down below. If you want to be sure that all components of this hijacker are eliminated, you should use automatic removal tools. We suggest taking some time and invest in a reputable antivirus utility which will not let you down and assuredly remove Startpage.com from your computer. Generally, Startpage is considered a regular search engine but its malicious counterparts may pretend to be the legitimate service as well. So, the original Startpage.com website should be easily removed from the browser by deleting it from the list of default search engines. But if the website bounced back to your browser, you are most likely infected with a browser hijacker and need to follow the instructions provided below to remove it from your computer. Here, look for Startpage.com or any other recently installed suspicious programs. It is unlikely that Startpage Trojan or software bundle will change your Safari homepage to any predetermined domain. But if it does, please follow the subsequent instructions to remove it. Wait until you see Applications folder and look for Startpage.com or any other suspicious programs on it. Now right click on every of such entries and select Move to Trash. When in the new window, check Delete personal settings and select Reset again to complete Startpage.com removal. Once these steps are finished, Startpage.com should be removed from your Microsoft Edge browser. In order to delete Startpage from Firefox homepage, you may need to uninstall suspicious browser extensions and reset the browser. Here, select Startpage.com and other questionable plugins. Click Remove to delete these entries. Now you will see Reset Firefox to its default state message with Reset Firefox button. Click this button for several times and complete Startpage.com removal. Here, select Startpage.com and other malicious plugins and select trash icon to delete these entries. Click Reset to confirm this action and complete Startpage.com removal. Here, select Extensions and look for Startpage.com or other suspicious entries. Click on the Uninstall button to get rid each of them. Here, look at the Homepage field. If it was altered by Startpage.com, remove unwanted link and enter the one that you want to use for your searches. Remember to include the "http://" before typing in the address of the page. Now you will see a detailed dialog window filled with reset options. All of those options are usually checked, but you can specify which of them you want to reset. Click the Reset button to complete Startpage.com removal process. ^ Gabriel E. Hall. How to Eliminate Browser Hijackers?. NoVirus. British website about computer viruses, their removal and cyber security news. ^ Dangerous Malware Ads Are Spreading Across the Interne. Computer Repair in New York City. Computer repair service and information. ^ Tim Fisher. What is Malware?. Lifewire. The website about technology and modern gadgets. ^ Anti-Malware. Techopedia. Technology terms dictionary and information. ^ Lowell Heddings. Here’s What Happens When You Install the Top 10 Download.com Apps. How-to Geek. How-to's and information about technology, computers and viruses. This entry was posted on 2017-08-11 at 08:52 and is filed under Browser addons, Viruses. You can quickly scan the QR code with your mobile device and have Startpage.com virus manual removal instructions right in your pocket. How did you remove Startpage.com virus?